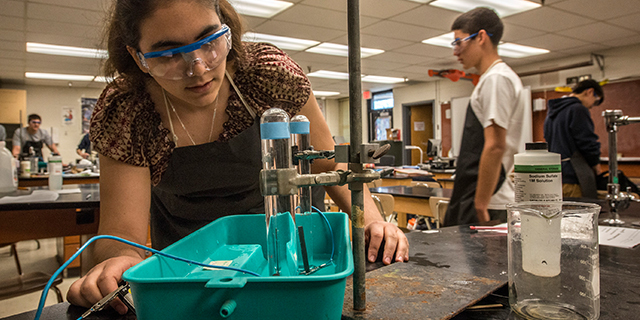 A majority of high school seniors in the U.S. say they enjoy science and around four-in-ten (44%) would like to have a job in the field, according to a Pew Research Center analysis of the 2015 National Assessment of Educational Progress (NAEP). These sentiments, however, tend to vary by race and ethnicity – a pattern that also is reflected in American students’ test scores in science. Overall, 71% of 12th-grade students agree with the statement, “I like science.” While majorities of all major racial and ethnic groups report having a fondness for science, Asian and Pacific Islander high school seniors are the most likely group to say this, while blacks are the least. Similar racial and ethnic differences emerge when 12th-graders are asked whether they want a career in science. Six-in-ten Asian and Pacific Islander high school seniors say they would like a job that involves science and 64% say it is important that they do well in the subject to get the kind of job they want. By comparison, 45% of whites, 40% of Hispanics and 39% of blacks say they want a science-related job, and no more than half of these respective groups agree that they need to do well in science to get the kind of job they desire. Recent studies paint a mixed picture of how U.S. students – not just high school seniors – are faring in science. Fourth- and eighth-graders, for example, have made gains since 2009, but test scores among 12th-graders have remained flat, according to the NAEP. And while some racial and ethnic performance gaps have narrowed over time, black and Hispanic students still score considerably lower than their Asian and Pacific Islander and white peers, regardless of grade level. Some experts have traced the relatively low share of blacks and Hispanics working in STEM professions to differences that emerge at an early age, and NAEP’s figures suggest that racial and ethnic differences in wanting a career in science may emerge at the high school level or earlier. For example, just over a third (37%) of black eighth-graders agree they would like a job that involves science, compared with 44% of whites and 55% of students of Asian and Pacific Islander descent.